Amherst, OH – Debbie Dixon, owner of YOUR Deli has decided to turn up the heat once again! This time it isn’t on one of her 60 gallon kettles of delicious, homemade chicken paprikash. Dixon has moved both her restaurant and chicken paprikash business to the former Higgins Pharmacy building located at 395 Park Avenue, directly opposite of the Amherst Public Library. Dixon has announced her plans to begin offering tours of her facility. “Tours will be made available to various local groups as well as one-day bus tours from areas of Indiana, Ohio, Pennsylvania and Michigan,” Dixon said. Groups will be received into the spacious climate-controlled restaurant seating area where tour guests can relax and unwind. “On warmer days, those who don’t care for air-conditioning are welcome to enjoy our outdoor seating,” Dixon said. Tours are expected to form from these casual seating areas and will include a brief visit to YOUR Deli’s ODA (Ohio Department of Agriculture) certified kitchen located just steps away from both dining areas. 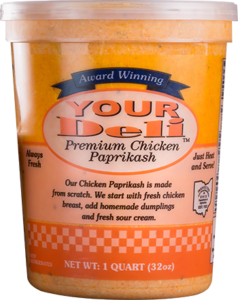 “Guests will have the opportunity to sample YOUR Deli Premium Chicken Paprikash™,” Dixon said. 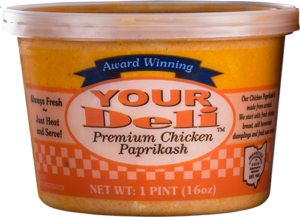 YOUR Deli will offer both dine-in and carry out dining, including the option to purchase various sizes of YOUR Deli Premium Chicken Paprikash™ to share with family and friends. In addition, guests can also purchase a piece of homemade Country Harvest Cheesecake for the ride home. Groups with interest are encouraged to contact YOUR Deli for more information. Additional details regarding dates and times will be posted at www.yourdeliamherst.com as scheduled tours are finalized. “Bus tour guides are welcome to contact YOUR Deli for specific details and information to learn more about the YOUR Deli Experience,” Dixon said. YOUR Deli’s new facility is located 10 minutes off of Ohio State Route 2 East and West as well as 10 minutes off of Ohio Interstate 80/90 East and West. The town of Amherst was established by German immigrants in 1811. Today, the City of Amherst continues to be known for being the Sandstone Center of the World. The downtown area is located approximately 2.5 miles South of Lake Erie. YOUR Deli Tours can be reached by calling 440-985-3354.